New Super Mario Bros. released for the Nintendo DS in 2006. The "new" in the title was a somewhat ironic reference to the fact that Mario had returned to his 2D platforming roots, a return that many gamers welcomed with open arms. It helped that the game was brilliant fun, of course. Over half a decade later, the "new" in the title takes on a further irony, because in spite of the fresh powers and an enhanced focus on collecting coins, there's really nothing "new" about New Super Mario Bros. 2. Still, Old New Super Mario Bros. 2 probably wouldn't look quite so attractive on the packaging. Not that being old means a game is necessarily bad. It just means it's not new. If there's one thing more tiresome than watching Princess Peach get kidnapped, it's reviewers pretending to be shocked that Princess Peach has been kidnapped. Suffice it to say that Princess Peach has been kidnapped, and Mario is yet again the only "man" capable of taking down Bowser and his wretched clan of amoral children. If you were expecting a rich story about the moral implications of transhumanism as Mario is forced to undergo life-saving robotic enhancements that he never asked for, then I'm sorry. Your change of pace is in another castle. New Super Mario Bros. 2 follows the blueprint laid out in 2006 with scalpel precision. There are six main worlds and a pair of optional ones to be discovered using Mini-Mushrooms in certain stages. Each world has stages presented on a map, with a sub-castle containing a mini-boss and a final castle containing a Koopa Kid (taking over from Bowser Jr. in the first game). 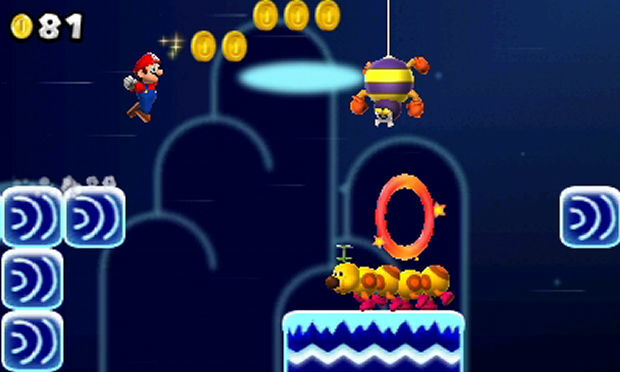 Levels have three hidden Star Coins which can be collected and spent to open new paths on the world map. The platforming gameplay is similarly faithful to archetypal specifications, as Mario scuttles from left to right, navigates chasms, and bounces on the heads of Bowser's usual Troopas, Goombas, and Drybones. There are a few new enemy types this time around, but most of them are just slightly varied plays on older creatures. As always, Mario can collect Mushrooms to increase his size, Fire Flowers to shoot fireballs, and Leaves to gain flying raccoon powers. If you've been in the same room as somebody playing a Mario game, you'll find it all incredibly familiar. None of this is to say that Nintendo hasn't made some small effort to shake things up. 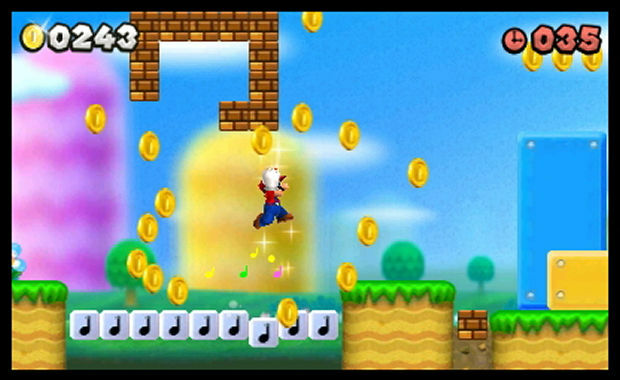 New Super Mario Bros. 2's token gimmick is greed, as players are showered with more coins than ever before. In prior games, coins existed merely as life currency -- you get 100 coins, you gain a 1UP. Now, coins practically drown players as they strive for the ultimate goal: collect one million of the things. No longer is the objective just to get through each course and put an end to Bowser's machinations. Now players have to grab as much gold as they can along the way. Most of this sequel's new ideas are based entirely around the premise of money-grubbing. New gold rings are situated in levels which, when passed through, turn enemies golden and reward the player with extra coins in a number of ways. For instance, if a golden Koopa Troopa is knocked into its shell and kicked along a platform, it'll drop coins along its entire path. Meanwhile, Hammer Bros will start tossing coins at the player instead of their namesake weaponry. 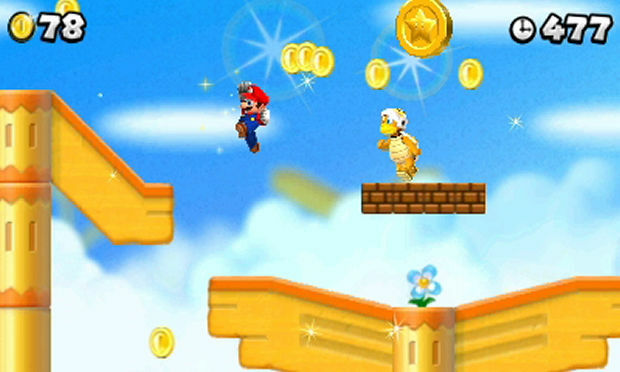 Players can also nab the Prize Block power-up, which this time plonks a golden cube on their head and dishes out more coins the faster Mario runs. NSMB2 goes out of its way to emphasize the importance of coins. POW Blocks are everywhere, ready to turn ordinary bricks into shiny gold. 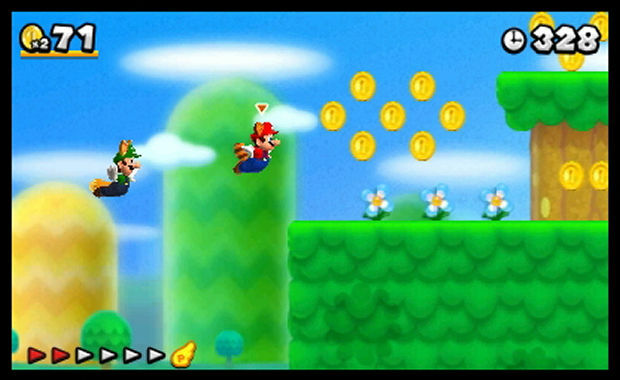 Coins will fly out from the background whenever Mario passes by invisible checkpoints. New roulette blocks dish out coins in multiples of five, and there's even a new Golden Fire Flower, which causes huge chunks of blocks to explode in a shower of money, and hands out five free coins for every enemy caught in the blast. As if that wasn't enough, Rainbow Courses can be unlocked, special stages that reduce the enemy count and focus entirely on snatching as much loot as possible. 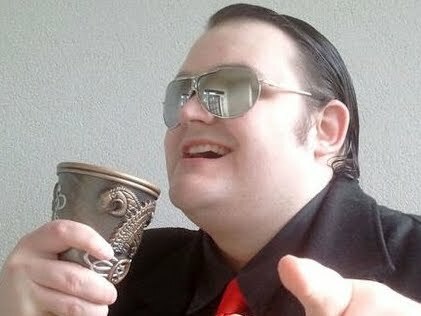 Although the shift in dynamic is subtle and mostly cosmetic, the exploitation of the player's natural hoarding instinct does instigate something of a change in the way the game is played. Most gamers have been trained by years of playing to collect stuff, and Nintendo knows this. It's no longer enough to just grab that flagpole at the end of a course and feel like a good job was done. True satisfaction can only be gleaned from a feeling that enough riches were obtained, and I have to commend Nintendo for dramatically altering the way the game is approached without doing much at all the change how it actually plays. Unfortunately, while NSMB2's lust for coinage gives it an addictive quality, it doesn't give it the same sense of replay value the original had. I played the original New Super Mario Bros. over and over again because it was just that damn splendid, and I wanted to explore every nook and cranny. Grabbing gold can be fun for a while, but it feels like a shallow endeavor, especially with the lack of tangible rewards during the long slog to one million coins. Being constantly reminded of how many coins I've collected doesn't so much inspire me to keep going as remind me how long I've still got to go, and one feels rather empty when constantly being told they've got thousands of coins with no real way to benefit from them. If a game is going to shower me in money, I want to feel like I can spend it. The coins, however, are as lacking in value as they've always been, and once the player cottons on to that fact, the collection angle feels vapid and unrewarding. The difference between NSMB2 and its predecessor is the difference between instinctual, thoughtless addiction and genuinely endearing infatuation. I must stress that New Super Mario Bros. 2 is still fun, and well worth obtaining. All the pieces are in place for a solid Mario experience. Level design is welcoming enough to new players while providing a few tricky challenges to veterans, and the optional content provides stiffer resistance overall. The platforming is as expertly crafted as it's always been, featuring skilled level design and some fiendishly placed Star Coins for those aiming to thoroughly complete their adventure. Everything's enjoyable, everything is as good as it's always been ... but it never strives to be better. Without the sense of wonder and nostalgia that the first game was able to milk, a lot of the gleam has worn off for this sequel. As Mario retreads familiar ground, revisiting the standard snow worlds and water worlds, going into more haunted houses and fighting some of the least inventive bosses of the franchise, one doesn't feel as inspired as one did in games past. In many ways, New Super Mario Bros. 2 feels like it's going through the motions, coming across more like a stopgap game than a true sequel in any sense of the world. The coin metagame only serves to enhance that feeling -- giving it an "expansion-with-a-gimmick" atmosphere as opposed to that of a new, full game. Outside of the main single-player mode is a "Coin Rush" sidegame that randomly selects three previously played courses and charges players with the task of collecting as many coins as possible and reaching the end of the level within a strict time limit. The player's best results can be shared via StreetPass, giving the mode a competitive edge that might make it more attractive. That attraction would have been better crafted, however, by implementing some online leaderboards. Instead, there is no online interaction, so the chance to compete seems artificially limited, all for a desire to justify the existence of the 3DS' local communication features. Co-op lets two players go through the main game together, though again it is local only -- and both users will need a copy of the game. Multiplayer is ostensibly just the regular game with another guy hopping around, a situation made doubly true by the fact that players have to inexplicably share a single screen. One player will always be tied to the camera of another, making him or her act more like Tails in Sonic the Hedgehog 2 than a true partner. Still, serious coin collectors will want to make use of co-op as much as possible, as it dishes out twice the amount of coins as payment for frustration. New Super Mario Bros. 2 is good. It was always going to be good, because Nintendo makes good games. That was never in doubt. However, it's a markedly more vacuous experience, bereft as it is of fresh gameplay and rigidly sticking to a formula with such zeal one would almost believe it a religious imperative of the developers. The coin collecting silliness may alter the player's approach somewhat, but it is nonetheless superficial and many players will doubtless get bored of it before hitting their million. The gimmick serves as an allegory for the entire game, really -- a glittering distraction, lacking any real substance. 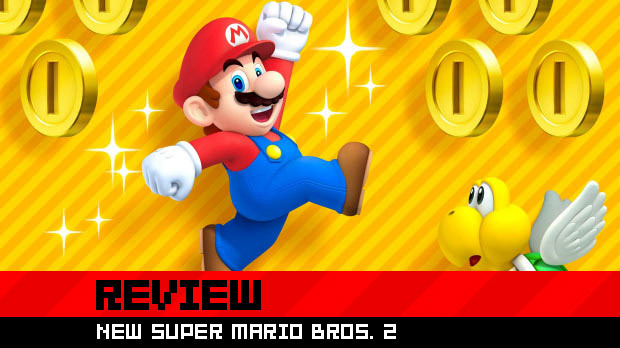 At its core, New Super Mario Bros. 2 is a Mushroom Kingdom coin -- shiny and addictive, but carrying no practical value whatsoever.